Cost: $300.00 per student. Can accommodate 1 – 2 students at a time. Utilizing an Oxy/Gas torch and various hand tools you will be introduced to the exiting and limitless, age old style of glass work known as “Lampworking”. Using “boro” glass you will learn how to work with heat, gravity, and various tools and techniques that are used to create marbles, pendants, beads, ornaments, pipes, goblets and so much more there isn’t room enough to list them all. Once you have been introduced to the basic techniques taught in this course, that are common to all functional and sculptural objects, you will be limited only by your own interests and imagination as to what area to focus your new skills on. 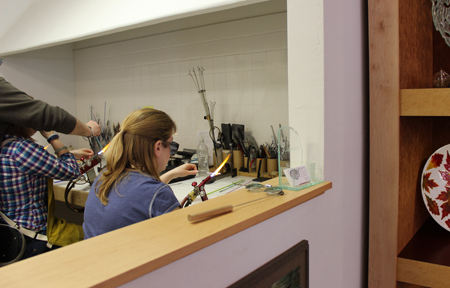 This course is geared toward Beginners with little or no experience working glass on a torch. You should have good coordination and dexterity in your hands and be able to use simple hand tools easily to have the most success in learning this craft. Class is open to students 16 and over (students under 18 must be accompanied by a parent or guardian). This course runs: 12 hours over two consecutive Sundays 10:00am-4:30pm with a break for lunch each day. Using the focused flame of a gas torch you will learn the basic steps needed to begin making glass beads on your own. 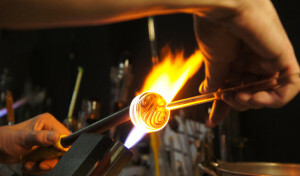 Heating and melting the glass while wrapping it around a metal mandrel, forming the bead. Learn to make various shapes, add color, and create patterns. A two hour class is usually enough to get a feel for the craft and produce some nice beads. It depends on the individual student as to how quickly they learn and how creative they can be. As with any class like this you need to play with the material in its working state to really understand the process.